SharePoint Document Recovery is an advanced software that will extract files and folders from corrupt MDF database with ease. With this rescuer of corrupt MDF database you can easily extract, repair and recover files and folders from corrupt MDF database. This secured and easy-to-use utility is ideal for: document libraries loss, drive failure resulting into server downtime and data inaccessibility, backups turning bad, and file deletion on WSS websites. It supports two repairing modes: Raw file recovery mode and Live SQL instance mode. The former helps to recover tables and the later is useful to recover files and folders from the orphan. All recovered files are listed in a tree like structure where the documents and files can be previewed. 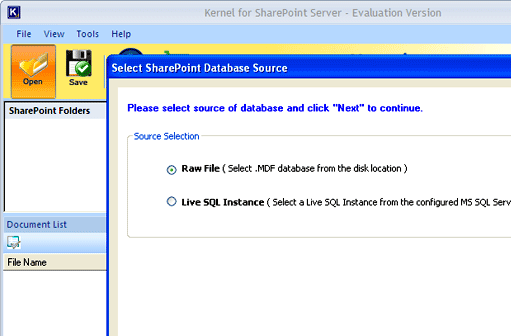 It also allows creating connection with MS SQL server through UDL file. This must have recovery program supports MS SharePoint Server 2007 and is compatible with MS SQL Server 2000, 2005 and 2008.